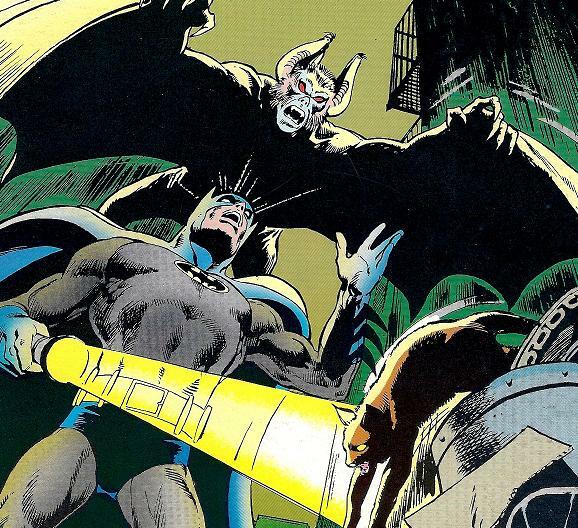 Earlier this week I posted about my second-favourite comic book super-team, the villainous but nuanced Suicide Squad. So it seems only fair that I devote some space to promoting my friend Jeff's satirical take on the team, as presented on his blog yesterday. Please head over to Jeff Shyluk's Visual Blog and feast your eyes on Doc Ock's Suicide Squad. The artwork is, as always, amazing, but the commentary is even more rewarding. 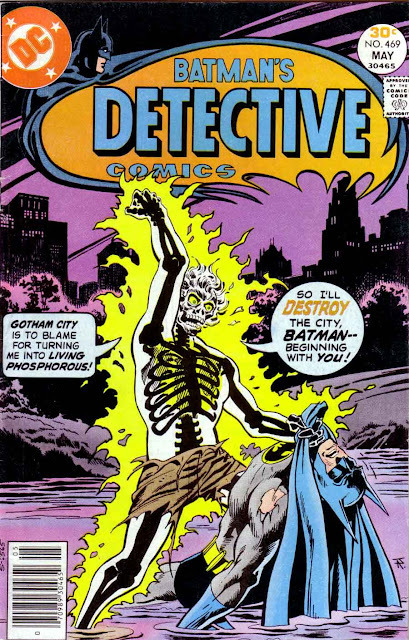 Doctor Phosphorus (Dr. Alexander Sartorious): I love skull-themed villains, and Batman villain Doctor Phosphorus happens to be a scary glowing transparent skeleton guy with a corrosive touch. He has a very bad disposition, making him perfect for the squad. The Haunted Tank: This is a Stuart M3 tank haunted by the spirit of General James Ewell Brown (J.E.B.) Stuart. 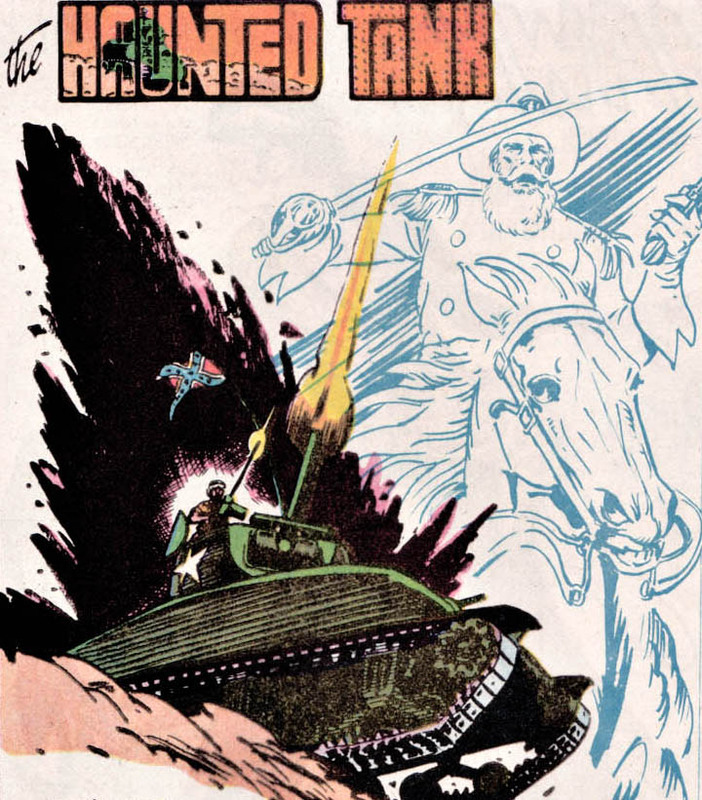 The original crew that manned the tank during World War II is long gone, but the tank remains - and General Stuart is none too happy to be mystically coerced into the service of the Suicide Squad. Will he support his new crew...or betray them? 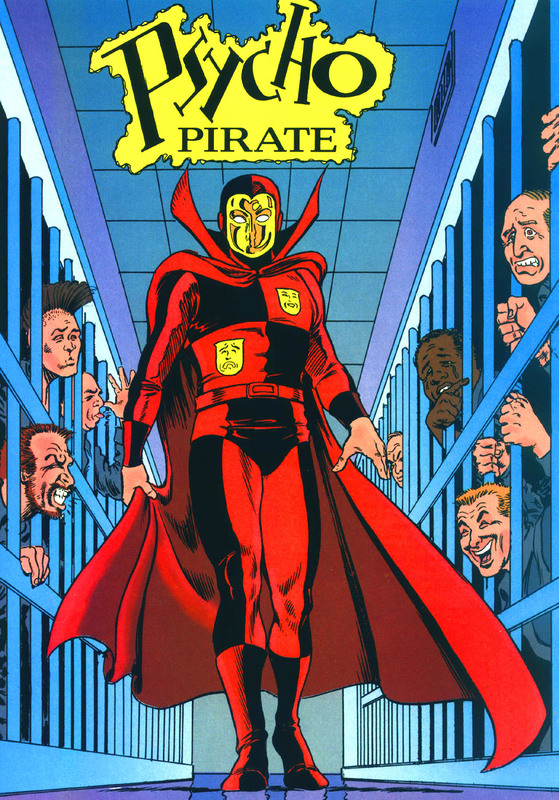 Hourman: An android from the 853rd century, Hourman is somewhat naive but extremely useful thanks to his ability to activate a "power hour" that gives him sixty minutes to warp the flow of time. 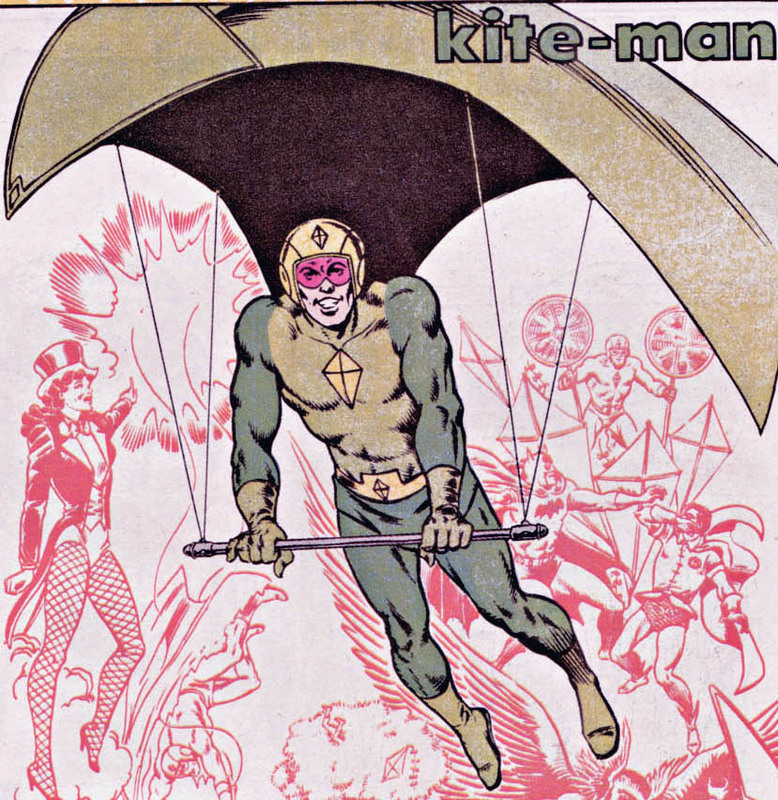 Kite-Man (Charles (Chuck) Brown: Kite-Man is a small-time crook with one gimmick: he can fly using his kite. 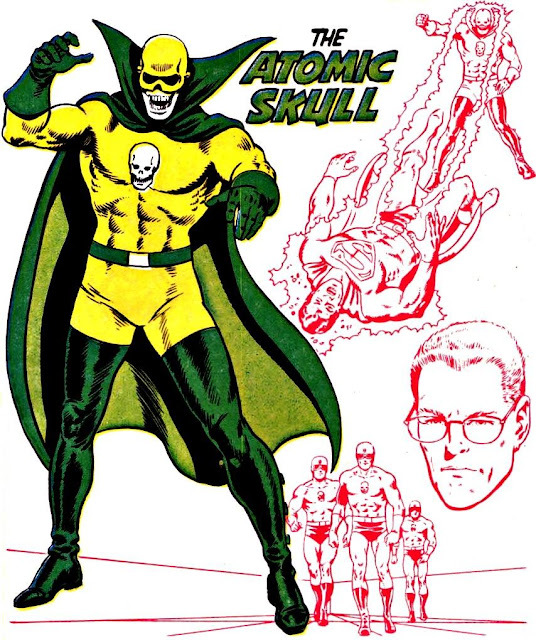 He's cannon fodder for my first issue. 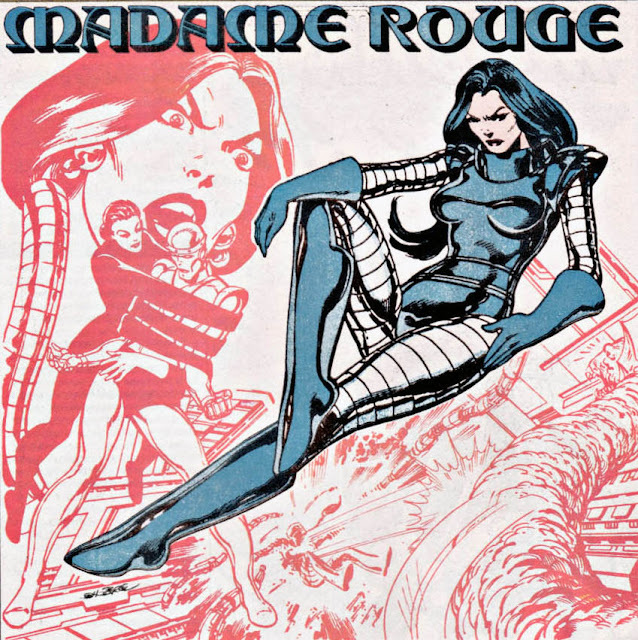 Madame Rouge (Laura DeMille): Responsible for a variety of crimes as a member of the Brotherhood of Evil, Madame Rouge has a malleable body that makes her a fearsome combatant and a shapeshifter. 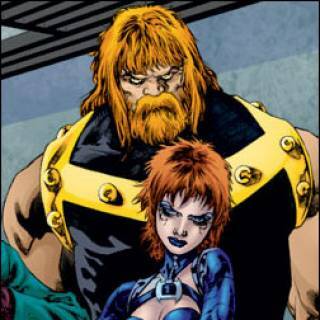 Mammoth and Shimmer: Each of these sibling psychopaths has a different mutant power: brother Baran is super-strong, while sister Selinda can transmute matter. They're devoted to each other, but that's about their only redeeming quality. Man-Bat (Kirk Langstrom): Cursed to live as a freakish man-bat by his own twisted science, I imagine Langstrom would be lured to the team by the promise of a cure for his condition. This is another of Sean's suggestions. Psycho Pirate (Roger Hayden): Psycho Pirate can induce fear, rage, lust - whatever emotion he etches onto his own features. 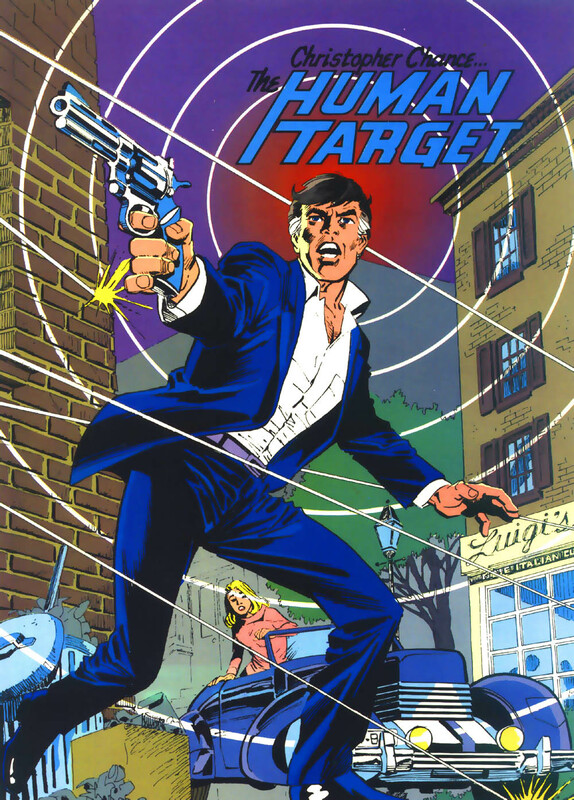 He's amoral and cowardly, but nonetheless useful for a variety of covert missions. 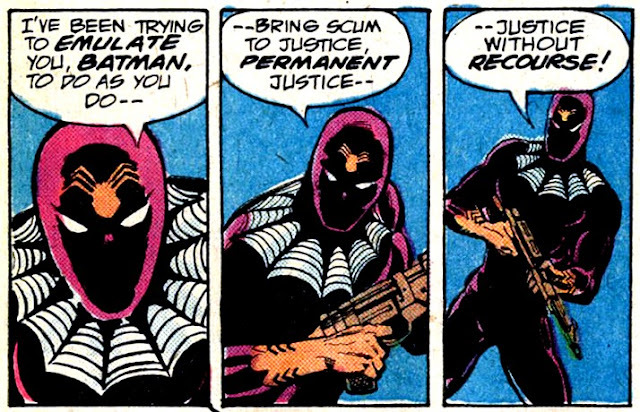 Ragman (Rory Regan): Ragman is a good guy, but his creepy motif - the ability to absorb souls of evil individuals into his "Ragman" suit - puts people off. 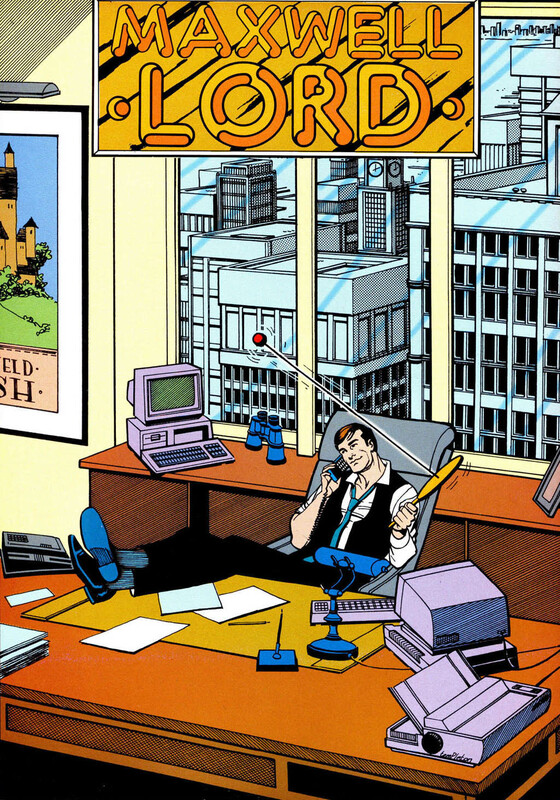 Maxwell Lord: Ruthless, cunning and manipulative, Max may seem like he serves nothing but his own purposes, but deep, deep down he wants to do the right thing - and thanks to past indiscretions, the government has put Max in a position to atone for his misdeeds, if not in the way he'd most prefer. So there you have it. I imagine I'd kill off a few of these picks during the first year or so and rotate in some of the other characters I've saved for later. Did I miss anyone vital? The rest of my Suicide Squad lineup will have to wait another day, as Mom and Dad have some stuff to sell! 1. A mere $50 for this 7 cubic ft. Danny freezer! Store your finest cuts of meat! 2. A Canadian Tire Super Cycle bicycle in like new condition - again, just $50! Ride like the wind! 3.For only $75 you can own this Troy-Bilt modelTB 360BV leaf blower/vacuum! Blow leaves around the yard with wild abandon! 4. Shed those pounds and tone those muscles with this Nautilus model U/R514 exercise bike - a steal at $125.00! Includes manuals! 5. And finally - sorry, folks, no photo of this one - a new, never used Sears CRAFTSMAN dustless electronic router, for just $50.00! If you know me, live in the Edmonton region and are interested in one of these items, you know how to reach me. Mom and Dad will deliver to Edmonton, Leduc and thereabouts, but you'll have to lug the stuff into your domicile. Some time ago I posted my ideal Justice League lineup; in the unlikely event I ever wound up writing the comic, that list includes the characters I'd most want to tell stories about. This time around I thought I'd list the characters I'd like to write about if I were suddenly granted a new Suicide Squad title. It's not really my "ideal" list, since John Ostrander and Kim Yale have already written the definitive Suicide Squad title, and I've imposed a strict rule on myself: I can't use any characters that have already been members of the Squad. 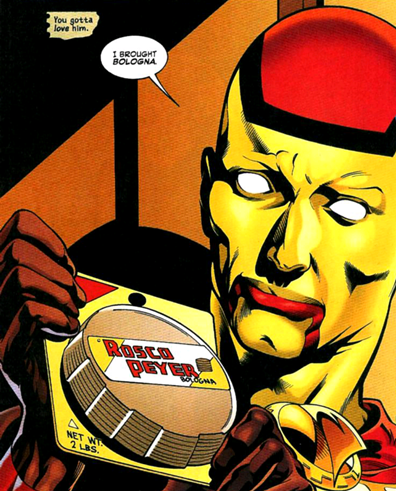 For those unfamiliar with the title, the premise of Suicide Squad is simple: the government decides that supervillains could be valuable assets for espionage/black ops missions that require deniability. Select villains are offered time off their sentences for completing missions. If they try to escape during a mission, the explosives implanted in their bodies go off. The team usually features an assortment of good guys, or at least anti-heroes, to keep the villains in line. It's all very dark and Machiavellian. 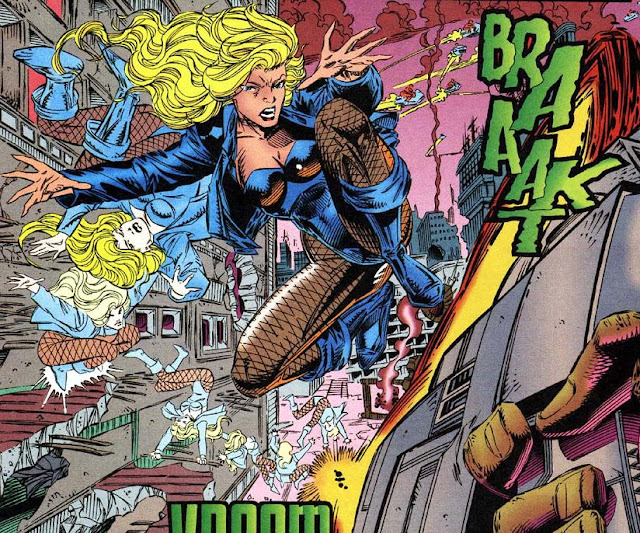 I've long been a fan of Black Canary; over the years she's become one of the most well-rounded female characters in comics, avoiding a bunch of sexist tropes despite the odds (and her most famous fishnet-and-leather costume). Dinah is not easily intimidated, she's grown into leadership, and she actually believes in redemption. She'd be critical of the whole Suicide Squad setup, but she'd feel compelled to make the most of a bad situation. Black Spider (Eric Needham): Every Suicide Squad needs an assassin with a troubled past (see: Deadshot), so Black Spider fills that role in my squad. He's also something of an underdeveloped blank slate, which leaves plenty of room for character development. 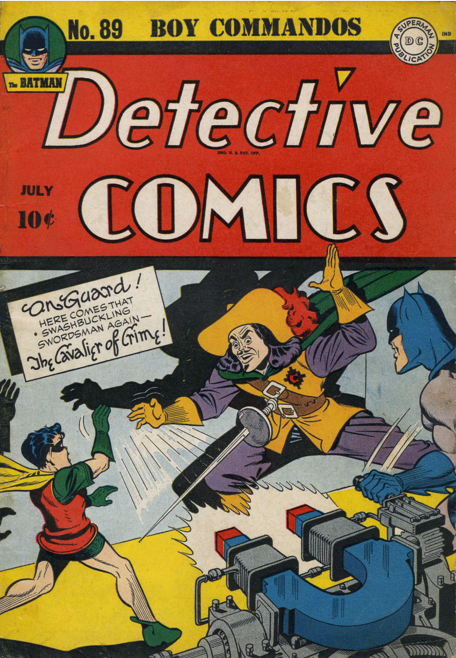 The Cavalier (Mortimer Drake): He's a foppish miscreant dressed like a...well, a cavalier, wielding a rapier. I figure he'd be good for a few laughs. 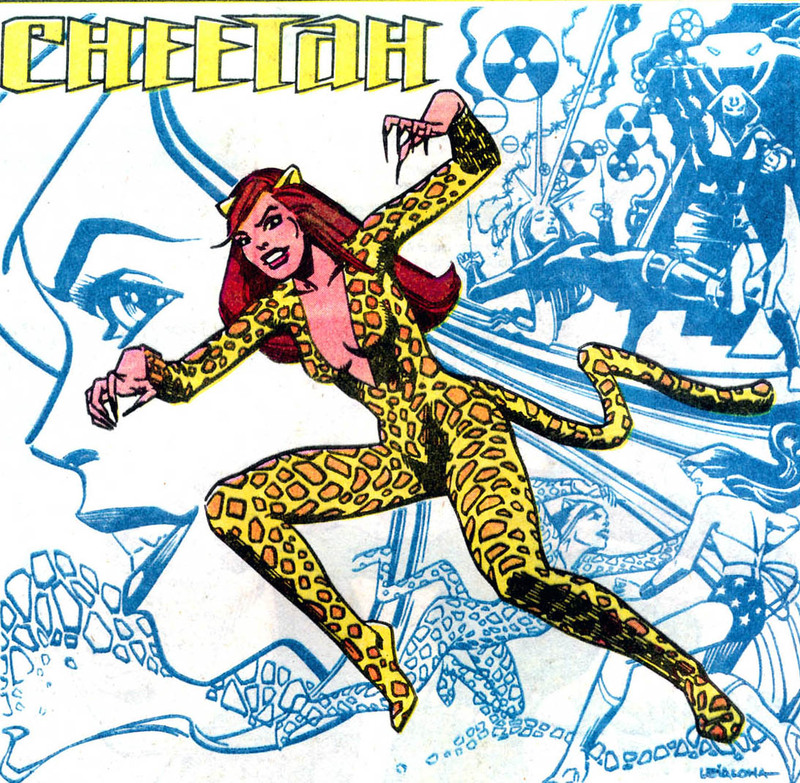 Cheetah (Deborah Domaine): This second iteration of the perennial Wonder Woman foe has a pretty awful backstory; she was once a decent human being, but she was kidnapped and brainwashed into taking the mantle of the evil Cheetah by the villainous Kobra. Her origin is filled with uncomfortable tropes, but perhaps there might be value in giving her a redemptive, re-empowering arc. Cheshire (Jade LNU): My brother suggested I add Cheshire to the roster, and I can see why; she's perfect for the team. 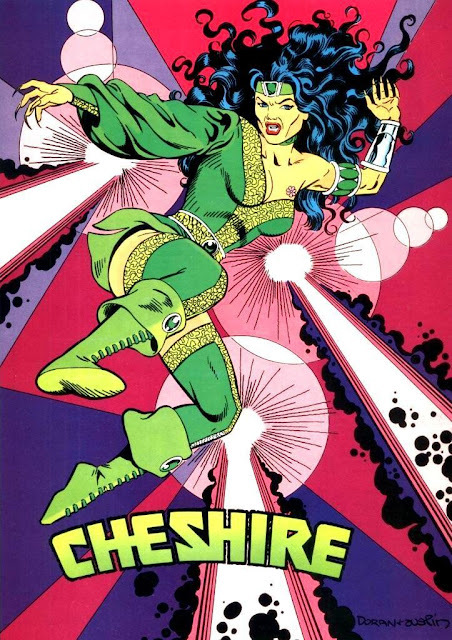 A deadly martial artist and poisoner, Cheshire has few redeeming qualities and would likely backstab any of her teammates for the slightest personal advantage. Crazy Quilt (FNU Quilt): Stricken with a rare form of colour blindness, Quilt commits colour-related crimes with his crazy laser helmet. He's the comic relief. ...and you'll find out who leads this crazy assemblage of ne'er-do-wells! I spotted this unusual art installation when Sylvia and I visited Las Vegas in December 2011. The acrylic cylinder contains water that's somehow spun into a funnel. The effect was somewhat mesmerizing. Here is a photo of Mom at the computer. I like this image because there's a little accidental forced perspective going on. Earlier this summer, Sean and Sylvia and I were travelling from Leduc to Edmonton. A discussion of laziness, chores and perceived roles of men and women ensued. We often ask Sean to help with household chores, and I joked that when one of these requests is detected, a mechanism in Sean's ears closes like an iris to prevent him from hearing about the chore. I extrapolated that most men have this ability, which made both Sylvia and Sean laugh. This would seem an handy mutation. 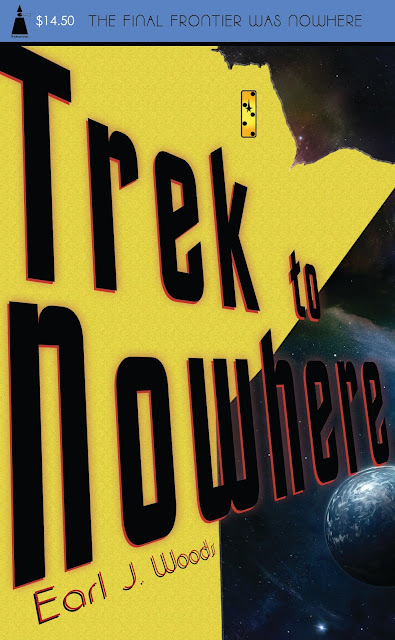 To honour Star Trek's 50th anniversary, here's another in my series of fake "Edge of Nowhere" novels. In this case, I had fun skewing text using paths instead of rasterizing the layer, which leads to a much sharper result. "Why do you insist on drinking milk from the carton?" A couple of months ago I discovered a small lump on the underside of my left ring finger, between the second and third knuckles. I stroked it with my thumb to test its consistency. It was quite hard, and resisted my attempts to move it very far. To see if it was painful, I applied pressure. To my surprise, it popped without a sound and vanished. There was no pain, just a feeling of vague unease. Had I just burst a malevolent sac of festering disease, or an air bubble waiting to give me an aneurysm? I experienced some anxious moments, but now that several weeks have passed I assume I'm in the clear. It was still a little weird, though. Since this is Star Trek's 50th anniversary year, Pete thought it apropos to prepare another Trek-themed Geekquinox dinner. The festivities got off to a scrumptious start with toasted bread topped with your choice of three salsas and garlic. Note the Galileo shuttlecraft centrepiece (actually the container for Star Trek Trivial Pursuit). ...though contrarian Mike arrived in a Star Wars shirt. Everyone's always delighted by my constant flash photography at these events. Steve ignored his hail to the bridge. My favourite course of the night: "The Wrath of Prawn," or cilantro lime shrimp. Juicy, tender, savoury. Just put it in your mouth, not your ear. Scott failed to contain his excitement. Jeff delighted me by making "voom" noises as he flew the shuttle around the table. "Spock's Brain," or cauliflower cooked in pork fat. I'm not generally a fan of cauliflower, but this was pretty good brain food. ...that's why I came dressed as an agent of the Department of Temporal Investigations (DTI). Pete's Red Matter soup was my second-favourite item of the night. Jeff may have found it a little spicy. Thanks again to Pete and Ellen for hosting yet another marvellous, out-of-this world dining experience. Truly, the feeds of the many outweighed...uh...I had something there, almost. Feast long and prosper, that's it! Woods out.